Your students will enjoy these fun speech patterns! Say the pattern and match the next picture in the sequence! 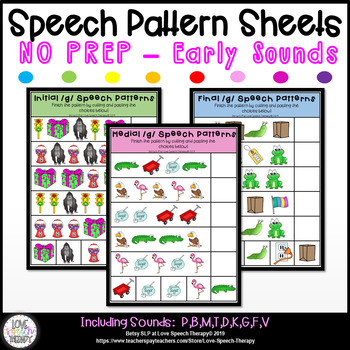 Students will get TONS of speech practice by saying each pattern! This is also perfect for fine motor skills. Included: 27 Pages - separate sheets with each positions for all 9 sounds! *Be sure to print around 95% for best formatting results when printing! View other Apraxia products of mine here! 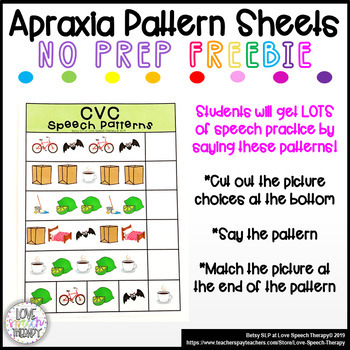 → Apraxia Phrases & Sentences - CV, CVC, CVCV Mats! I hope your enjoy this FREEBIE! I'd love to hear your feedback below!! !